Structural modification of a reactant molecule may influence the rate or equilibrium constant of a reaction through polar, steric, or resonance effects.1† When a substituent is introduced at a point remote from the reaction centre, only the operation of polar effects need usually be considered, and quite detailed understanding of the influence of structure upon reactivity is possible. 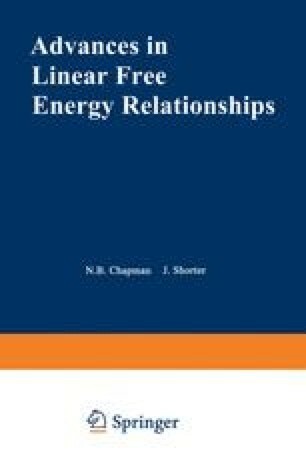 Linear free energy relationships, notably the Hammett equation,2 are very important in this (see Chapter 1). When the structural modification is close to the reaction centre, our understanding is less advanced. Thus for many years it was impossible to assess the relative importance of different factors contributing, for example, to the ‘ortho-effect’ in aromatic systems.3 The occurrence of steric as well as polar effects in aliphatic systems and ortho- substituted aromatic systems complicates the devising of linear free energy relationships. Little progress was made in this direction until 1952, when R. W. Taft developed a procedure for separating polar, steric, and resonance effects,4 based on an analysis of the rate coefficients of alkaline and acid-catalysed hydrolysis of esters. Considerable use has been made of this ‘Taft analysis’ and of substituent parameters developed from it.